When I looked at the QuiltCon workshop schedule, there were two classes I had my heart set on. One of them was Lotta's print class, which I got in to. The other one is a class with Yoshiko Jinzenji. I nearly cried when I realized she will be teaching her classes at the same time as I will be, so I won't be able to take a class by her. Back to the title. I'm shocked that Yoshiko's class isn't sold out. I am seriously at a loss for words. The only thing I can think of is that people don't realize who she is. So let me help. Yoshiko is the first Japanese quilter I fell in love with. Her quilts and projects are fabulous. Minimalistic, and packing a whopping punch. My first bits of Yoshiko fabrics were given to me by Jacquie 2 or 3 years ago. So do yourself a favor. If you have time in your schedule on Saturday or Sunday T QuiltCon to take her half day class, you must. If only to tell me all about it! For me, I'll have to be satisfied with a lecture she will be giving. p.s. 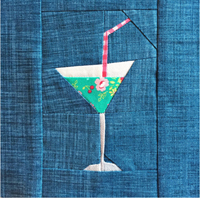 I hope you don't mind, Alissa, that I used your Traveling Quilt as the backdrop for this post! I'm surprised, too. Sheer fabric was my second string as a half day class, but I'm doing everything I can to avoid bringing/needing a sewing machine. I want to travel light for once. However, if funds loosed up, I definitely add in the Saturday morning workshop if its still around. I don't think it's because people don't know her that the workshop hasn't filled up. It's the sheer fabric that people are shying away from. I don't like them and I've worked with them in garment construction and quilts. actually Jenny, the sewing machines will be provided for all those attending workshops, so no need to bring yours anyway! Penny, I appreciate your introduction to Yoshiko and her work. I'm going to go do more investigation of her work. Happy day to you! You talked me into it! I did have no idea who she is, but now I am in her class Sunday. I was already intrigued by the class description, so thanks for the encouragement! Wow!! I haven't had quiltcon on my radar, because, it's so hard to plan ahead for things like this with the hubs away. I'm hoping that maybe I can sneak a transfer ticket or something if the scheduling would even permit me to go. We'll see. I'm so excited for you to be able to teach there!! Yushiko is amazing. 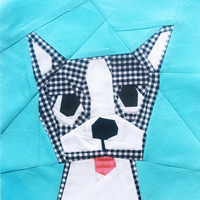 I thought about signing up for the Saturday course, but it conflicts with one of the must-haves that I'm taking-- your freezer paper piecing workshop! I am absolutely thrilled to get to learn from you, and wish I didn't have to keep Sunday open for travel so I could take your advanced course that day. Can t wait for february! Yep, I need to be satisfied with just the lecture as the class didn't work into my schedule. Her work is AMAZING! I was NOT shocked - just disappointed - that your intro class sold out so fast! I love your work and dream of having skills like that someday. Well, maybe next time! I was too late to get in any classes that I wanted, so sadly, I have decided not to attend. I'm not going, but her class would be at the top of my wish list! I also have her book and spend many hours looking and dreaming about someday doing even one of her design justice! I'm shocked too! I'd have signed up for her class immediately if I were going... such a pity because her work is beyond magnificent. I have a friend who signed up for QuiltCon yesterday and was able to register in Yoshiko's class! I think the fact that her workshop was the only one with an advanced skill level rating might have limited the group of people who would register in it. I never know whether to consider myself intermediate or advanced, even though I've been quilting for over 15 years! I also love her work, and bought her book as soon as I saw it. And my sched is full. Hopefully she will be here next time too. I didn't have good luck getting the classes I really wanted, and the one I settled on is scheduled at the same time. So sorry I'm going to miss her class. I totally agree. I wanted to take the same classes as you and am happy to say that I got them both. When I read the schedule, Yoshiko's class was the first on my list. I am so excited. If i was going, :(, i would soooo take her class.. i have checked her book out several times from our library... i need my own copy! Agreed! I can't believe they were sold out either!! She is a legend, and I would LOVE to meet her or be taught by her! Hahaha! I too am bummed by the number of classes I can't take because I'll be teaching. But I was thrilled to get into her class. And I got the printing with Lotta class too. I bet the class sells out now! You are great advertising. I squealed out loud when I saw that Jinzenji was on the teaching schedule. Her work is such an inspiration! Unfortunately, my classes conflict with hers too :( Thanks for this great post! That was the one class I wanted to take but I also have trouble planning something so far out in advance. I took Lotta's workshop in Palm Springs and it and she was amazing! I am thrilled to be in one of her classes. She is so inspiring and her work is so amazing. Can't wait!